We tried to avoid the dinner crowd by arriving shortly before 8 p.m. Even so, there were at least 70 people in line waiting to be served. But this restaurant wait was different than others-everyone in line shared a sense of anticipation, as if we knew that the payoff was going to be worth the wait. Mom, Dad, hubby, and I spent the time working on our menu strategy-for each of us to try something different and share. Thirty minutes later, we sat down to enjoy ribs, sausage, and coleslaw (Dad), brisket, pulled pork, and red beans and rice (Mom), a "Z-Man" sandwich-brisket nestled beneath provolone and two onion rings atop a Kaiser roll (me), and the night&apos;s special, "Hog-o-mania"-ribs, sausage, pulled pork, baked beans and fries (hubby). The brisket was moist, tender, and lean with great smoke flavor. The ribs (the barometer by which I measure all barbecue) were juicy, fell off the bone, and had a deep blush of a smoke ring that is the sign of having spent several hours at a "low and slow" heat. We all agreed that the ribs were the best we&apos;d EVER had. The red beans and rice were a creamy comfort food with a spicy little kick. I bet you&apos;re saying, "but what about the sauce!?!" I also judge barbecue by the sauce and prefer K.C. style. But I had an epiphany at Joe&apos;s Kansas City-truly good barbecue doesn&apos;t need sauce (I can&apos;t believe I just wrote that). Dad agreed, saying that the meats produced by owners Jeff and Joy Stehney and their team are moist and flavorful enough to stand on their own. But take comfort, sauce lovers. Joe&apos;s offers their original homemade sweet and smoky sauce or a citrus-sweet and fire-on-the-back-end "Night of the Living Barbecue Sauce." I thought both were perfect for dipping the crispy outside, tender inside fries. 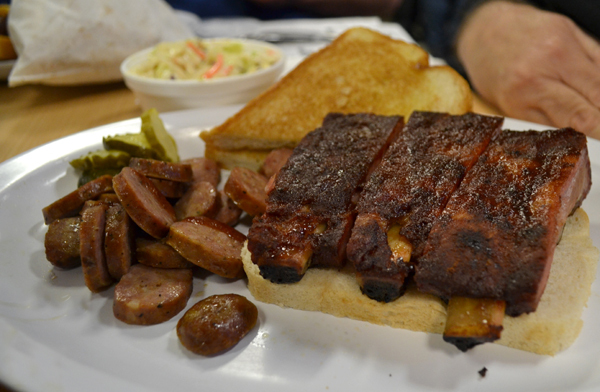 There&apos;s no place like Joe&apos;s Kansas City for a great barbecue experience. It is worth driving an hour-or more-for the meal. But while you&apos;re there, why not linger? Shawnee Indian Mission State Historic Site is just a few blocks away. If you&apos;re visiting the Olathe location, be sure to shop the neighboring Kansas City BBQ Store (also run by the Stehneys) for seasonings, sauces, smokers and cool barbecue tools. Joe&apos;s also has a location in Leawood near Town Center Plaza, a shopper&apos;s paradise. Like pizza, hotdogs and other subjects of foodie debate, "the best" barbecue is defined by the palate of the person enjoying it. So-where&apos;s your favorite Kansas place grab a slab? Sauce or no? Teresa Jenkins is all business during the week, but on the weekends, she, her husband and 11-year old son enjoy loading up the car and hitting the Kansas byways in search of good food and the great people who prepare and serve it. Her favorite cuisines are Mexican, Italian, and "anything with flavor!"